The AirHogs are an independent minor league baseball team located in the heart of Dallas-Fort Worth Metroplex. 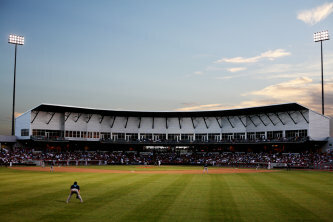 As a member of the American Association of Independent Professional Baseball, the team plays 100 regular season games per year from May to September, including 50 home games played at QuikTrip Park at Grand Prairie. With ticket prices starting as low as $8 and a variety of entertainment options at the ballpark, the AirHogs offer something for everyone! The AirHogs play at the brand-new QuikTrip Park at Grand Prairie located in the heart of Grand Prairie's Entertainment District directly between Lone Star Park and Verizon Theatre in Grand Prairie, TX. The $25 million venue, seats 5,500 guests and features 13 luxury suites. Amenities at the stadium include: The AirHogs Pool and Party Deck, the 17,000 sq. ft. Grand Prairie Wide World of Parks Playground, the FieldHouse Grill & Bar, the 3rd Base Party Deck, the Coors Light Officers Club and the Admirals Club. QuikTrip Park hosts special events such as live boxing, concerts, car shows, festivals and corporate events. Can I bring food or drinks into AirHogs games? No outside food or beverages are allowed. Our concession stands carry a wide variety of food and beverages which are available for purchase.